Komets great Lionel Repka has passed. Rest in Peace "Choo Choo" you are one of the reasons there is a Komet Nation! Loved by many, you will be missed by all who know you! And as Chuck Bailey reminded me, Tuesday was the 50th anniversary of the Komets' second Turner Cup in 1965 which Lionel was such a big part of. So sorry to hear that. My thoughts and prayers go out to his family and friends. So very sad to read about the death of Lionel Repka. I'll never forget how Repka, when starting a rush up the ice would get up on the points of his skates, and take a few choppy strides. Jack Loos would always play the train "whistle" sound on the organ as Repka proceded with the puck. For fans, the price of having a franchise that is 64 years old is that we will continually "lose" our longtime favorites. For fans, the gift of having a franchise that is 64 years old is the memory of those same favorite players that can never be taken away. Biblically the number 6 represents the number of man. 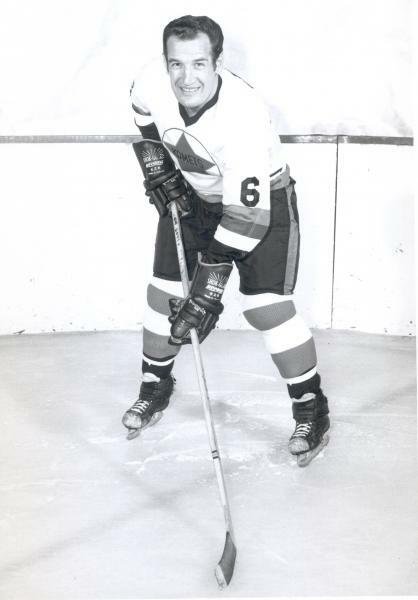 Komets star, Lionel Repka, number 6, was a heck of a man. Best story I ever wrote about Lionel, and it really tipifies the man. In a roundabout way, he's also the reason Mike Emrick became a hockey announcer. On March 8, 1962, 14-year old Randy Dannenfelser came home from school to find a large Manila envelope on the kitchen table with ``L. Repka'' on the return address. Dannenfelsercouldn't remember ever being so excited. In fact, he couldn't even remember what it felt like to be excited. Dannenfelser and his sister Linda were living with their aunt and uncle in Great Neck, N.Y. Their mother had died in November 1959 at age 43 from a stroke. He found some solace in listening to Bob Chase broadcast Komets games on WOWO. His favorite player was Lionel Repka. As a fellow defenseman, Dannenfelser molded his own game after what he imagined Repka did. Over the 1961 Christmas break, Dannenfelser wrote his hero. Figuring he might get a response if he included a question, he asked what number Repka wore. As a kid he had hope but didn't know whether to expect a response. ``Thank you very much for your letter which I received last week,'' Repka's letter on Komets stationery began. ``Glad to hear that you follow the Komets over WOWO and enjoy playing hockey with your three friends. ``As to your question about my hockey number, Randy, you are right. I wear number 6. I am also an alternate captain like you are on your hockey team. ``We are hoping to make the playoffs this year. So far we are in fifth place. Dannenfelser was thrilled with the letter and an autographed picture. He isn't sure how he opened the envelope without ripping it. The next day his aunt replaced No. 2 with No. 6 on his uniform. Almost 40 years later, Dannenfelser, now an industrial credit manager turned writer, has the picture hanging on his home office wall. He used the Internet last spring to find an old school friend, and realized he could try to find Repka. He never had a chance to thank Repka for the picture. After contacting The News-Sentinel, Dannenfelser got Repka's e-mail address and wrote a three-page letter. A few days later, Repka called Dannenfelser at his Stillwater, N.J., home and they talked for almost three hours. Dannenfelser had goose pimples throughout the conversation. The two men became friends and talk regularly on the phone and continue to send e-mails. A few weeks ago, Repka called Dannenfelser and told how his son Ron had died Sept. 18 when he was hit by a car while riding a bike. Dannenfelser's wife Barbara is sewing a Komets quilt to be auctioned or raffled to benefit the Ronald G. Repka Foundation. Lionel Repka is just glad to have a new friend and hopes to meet Dannenfelser this summer. He would like to introduce Dannenfelser to some of the Komets from that era. Which should also be the message for today's players. I remember watching Lionel playing hockey when I first started going to the games. What a great player and human being he was. I will never forget him. RIP Lionel you will be missed.